Our experience has taught us that patients view cosmetic surgery as an investment in how they look and feel about themselves. Getting the most out of life through Beauty, Confidence and Elegance has been our patient’s way of seizing life’s opportunities, and it is understandable that financing plastic surgery is a very reasonable choice. Financing San Diego plastic surgery resembles a credit card. This option allows you to make affordable payments over time, rather than paying one whole amount, and start enjoying your new look today. Applying online is extremely convenient and only takes a few moments. Our Financing Partners: Care Credit, Sharper Image, United Medical Credit, and Prosper Healthcare Lending. Our financing partners have been in the business of financing healthcare for individuals and families for many years. They help our patients consolidate and manage healthcare expenses that aren’t covered by insurance such as San Diego cosmetic surgery. Our staff is trained in these latest financing programs, which can even help those with struggling credit get approved for many procedures. Our staff members will help you understand the costs of your procedure and learn what you need to know about financing. After your consultation with Dr. Chacon, a staff member will review all fees with you and help you work through your options. If you decide you’d like to finance your plastic surgery, we can even help you fill out the loan application right in our office. If you have questions about fees or financing, please contact us online or give us a call at 858.633.7546. We understand that finances can sometimes be an issue when you are considering a cosmetic procedure. 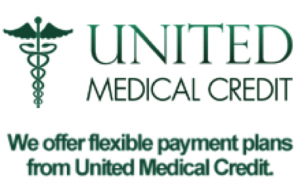 In addition to accepting all major credit cards and cash for payment, Divino Plastic Surgery is pleased to offer you many financing options, including United Medical Credit shown below. Divino Plastic Surgery accepts almost all major commercial PPO plans and Medicare. Please note that health insurance plans are always changing, but you can visit your plan’s website or call the number on the back of your insurance card to get more information on your specific coverage. If you are still in doubt, please call us at 858.633.7546, and we will be happy to help you double check your coverage.